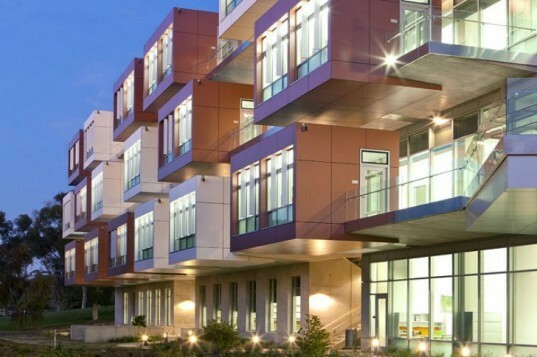 The Sanford Consortium for Regenerative Medicine is an innovative collaborative research center designed by Fentress Architects for five world leaders in life sciences research. 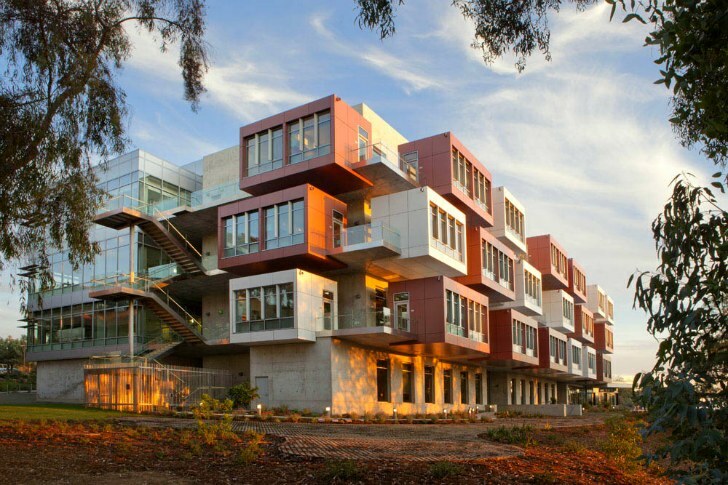 Not only does the 'collaboratory' bring together leading scientists from the Salk Institute for Biological Studies, The Scripps Research Institute, the Sanford-Burnham Medical Research Institute, the University of California at San Diego, and the La Jolla Institute for Allergy and Immunology, but it's also designed to LEED Gold standards and is awaiting certification. A creative layout encourages researchers to meet and work together, while energy-efficient design and other green building strategies set this facility in a class of its own. The 150,700 sq ft research facility provides space for 330 multi-disciplinary scientists to work in a synergistic and collaborative atmosphere. The four-story building features new café and a 150-seat auditorium separate from the laboratory building, where scientists can gather for talks, presentations and symposiums. To break the scientists out of their private research, Fentress Architects worked with Davis Davis Architects to design a facility that encourages chance meetings and collaboration. As more scientists work together, greater advances can be made in a variety of biomedical technologies and we can gain a greater understanding of life, health and medicine. A number of cantilevered pods provide a creative approach for private office space, and each one enjoys views of La Jolla and the surrounding research campuses. Naturally, the research facility features the latest and greatest in lab and science equipment, but it was also designed to high environmental standards. Currently the facility is seeking its LEED Gold certification. The landscape surrounding the building has been planted with native vegetation, sown with recyclable pecan chip mulch, and upgraded with bioswales in the parking lots to filter water naturally. Windows are optimized with shading devices to provide daylight and views, while natural ventilation minimize energy use for heating and cooling. Displacement ventilation and chilled beams enhance energy-efficiency, while low-flow plumbing fixtures and water efficiency strategies minimize water use by 40%. “Our design features the latest innovations in research and sustainability, while honoring the modern aesthetics of the neighboring Salk Institute. The signature office “pods” speak to Louis Kahn’s extraordinary design while fostering collaboration and communication among researchers.”- Curtis Fentress, Principal-in-Charge of Design at Fentress Architects. The 150,700 sq ft research facility provides space for 330 multi-disciplinary scientists to work in a synergistic and collaborative atmosphere. The four-story building features new café and a 150-seat auditorium separate from the laboratory building, where scientists can gather for talks, presentations and symposiums. To break the scientists out of their private research, Fentress Architects worked with Davis Davis Architects to design a facility that encourages chance meetings and collaboration. As more scientists work together, greater advances can be made in a variety of biomedical technologies and we can gain a greater understanding of life, health and medicine. A number of cantilevered pods provide a creative approach for private office space, and each one enjoys views of La Jolla and the surrounding research campuses. Naturally, the research facility features the latest and greatest in lab and science equipment, but it was also designed to high environmental standards. Currently the facility is seeking its LEED Gold certification. The landscape surrounding the building has been planted with native vegetation, sown with recyclable pecan chip mulch, and upgraded with bioswales in the parking lots to filter water naturally. Windows are optimized with shading devices to provide daylight and views, while natural ventilation minimize energy use for heating and cooling. Displacement ventilation and chilled beams enhance energy-efficiency, while low-flow plumbing fixtures and water efficiency strategies minimize water use by 40%. “Our design features the latest innovations in research and sustainability, while honoring the modern aesthetics of the neighboring Salk Institute. The signature office “pods” speak to Louis Kahn’s extraordinary design while fostering collaboration and communication among researchers.”- Curtis Fentress, Principal-in-Charge of Design at Fentress Architect. A cross section of the facility showing the office pods. Floorplan of the Sanford Consortium.